Examples: College recruiting, Diversity recruiting, Military recruiting, etc. 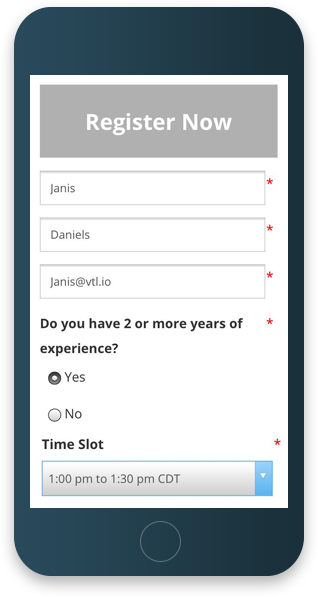 You can use our landing pages for in-person event or interview scheduling too! Branded communications will increase show-rates and provide valuable touchpoints with candidates. 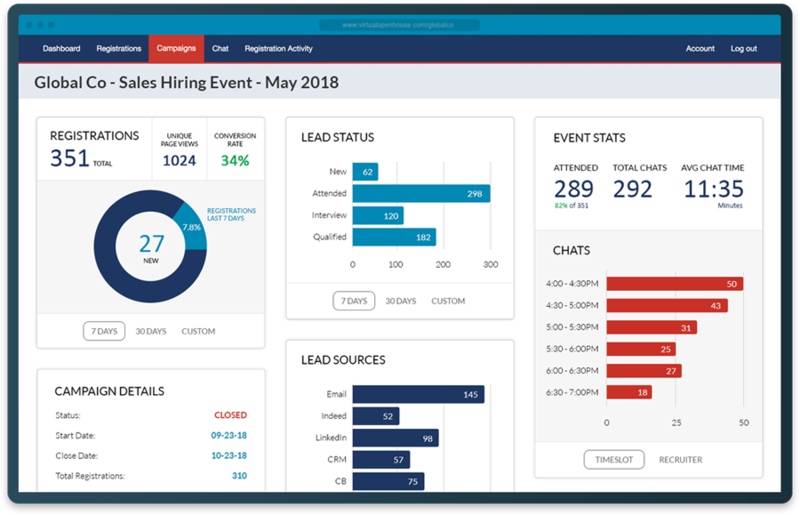 View and download all candidate registration data, take notes, and use company specific statuses to keep track of where candidates are in your hiring funnel. Candidate Data (including chat logs, notes, resumes, statuses) is saved and can be passed to your ATS or CRM. 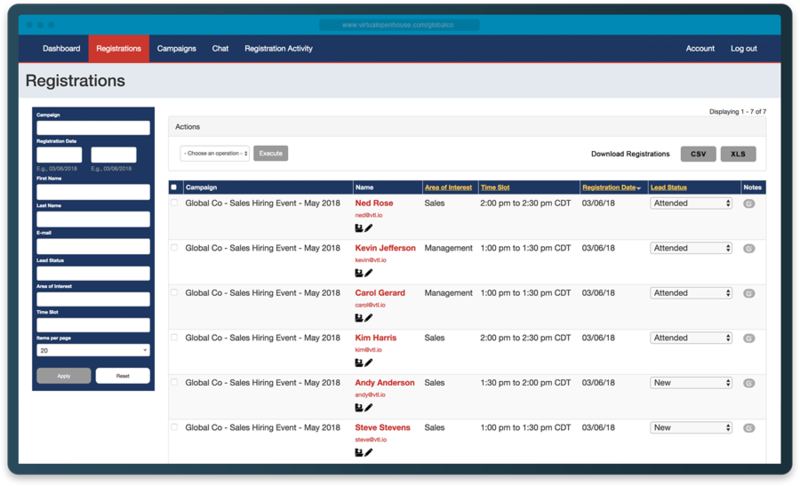 Connect with candidates in real time via the intuitive chat event interface. 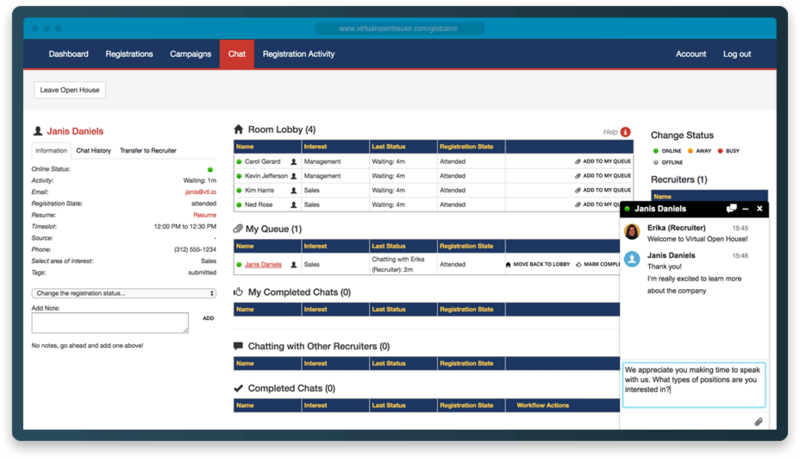 Chat with candidates while viewing their registration data, take notes and change candidate statuses, or transfer candidates to other logged in recruiters. Landing page analytics – See unique visitors, conversion rates, trends. 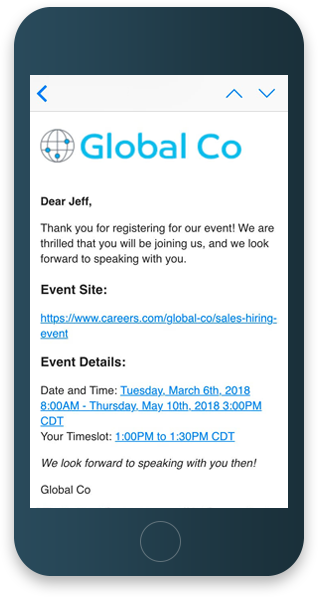 Event analytics – See how many candidates came to the event, how many chats recruiters had with candidates, how long they chatted with them, etc. 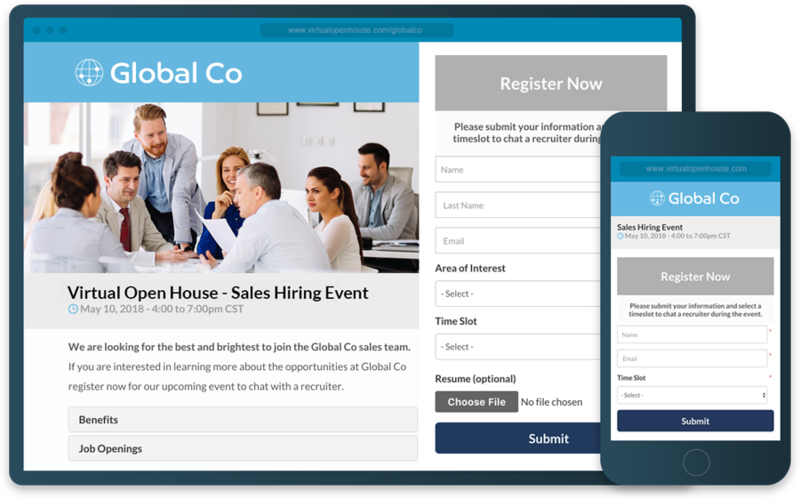 Media – We are proudly partnered with CareerBuilder.com to help drive candidates to your events. CB’s Talent Driver Group are experts in marketing strategy and optimization and will work to create the perfect mixture of media to deliver you the most relevant candidates for your Virtual Open House events. Custom Sourcing Solutions – We can assist your team in sourcing candidates using a variety of media sources to drive qualified traffic to events. Optimization – With candidate source tracking, we will help you identify the media that delivers the best results. Onboarding – A project manager will guide you through project kick-off, landing page design and platform configuration. Their goal is to make your onboarding a smooth and simple process. Team training – A mock event will be scheduled before your first live event, where your team will learn the platform and get any questions answered. Event support – A VOH technician will be logged in during events for technical troubleshooting or questions.